MS Paint is usually associated with poor graphics, but not in this case. American illustrator Patrick Hines proved he doesn’t need fancy apps to create awesome artwork; stunning skills can be mastered in Microsoft’s simple painting program! 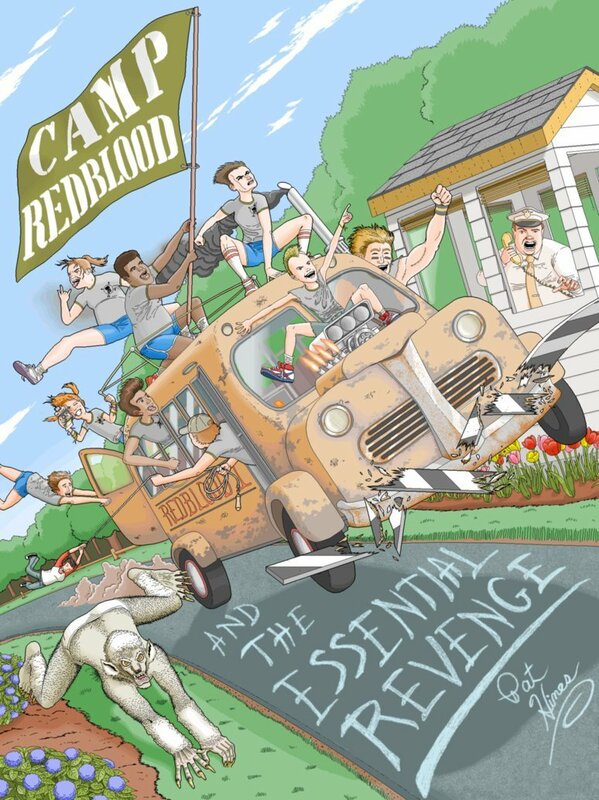 Regina Konstantinova — Once upon a time, Boston-based amateur illustrator Pat Hines decided to create his own graphic novel, Camp Redblood and the Essential Revenge. Being bad at Photoshop and other programs, he worked exclusively in Microsoft Paint for over 10 years, honing his craft working long overnights at a hospital reception desk. "I prefer MS Paint because I tend to be overwhelmed by more advanced programs like Photoshop. I enjoy working within Paint's constraints," the artist told Sputnik. Patrick revealed he had been working on the concept of his novel since 2008 and first started it in 2014. "I finished it in 2015, but it took another year to complete the full-color illustrations," he added. According to "the Paint guru," his self-published e-book is about a summer camp in the 1980s that seeks revenge after its youngest campers are brutally pranked by a rival camp. "There are a lot of laughs, but also adventures and some elements of supernatural horror. Tonally, the story is a combination of Harry Potter, The Goonies, Dazed and Confused and Animal House," he said. Believe it or not, all these pics were created with only a mouse in MS Paint. "I created eight full-color illustrations, plus the cover. Each illustration took about a week or two to create," Pat told Sputnik. The artist even agreed to share the secrets of how he creates his amazing artwork step by step: he starts out with the pencil tool, scribbling a very rough version of the picture. According to Pat, such drawings tend to be very messy and "look like what most people expect a drawing in MS Paint to look like." "I go over those scribbles and make them very light. I do this with the eraser tool, but I hold down the right button on the mouse," he continued. This "trick" doesn't erase the lines but changes them to whatever your secondary color is in the color palette. "Then I use the line tool to create the line art, going over the scribbles. After that, I erase the original scribbles completely. This is my version of layers. After that, I just color in everything using Paint's color palette," Patrick explained. Meanwhile, Microsoft announced it was going to remove its basic graphics editing program in a future Windows update. The news was followed by an incredible outpouring of support and nostalgia around MS Paint, which first appeared in Windows 1.0 more than 32 years ago. The public reaction made the company rethink the program's fate. "MS Paint fans rejoice: The original art app isn't going anywhere — except to the Windows Store for free!" the company wrote in a blog post. Of course, Patrick Hines was very pleased that they are keeping it. "I have several versions of the program on separate computers, so I would have been able to go on using the program, but it would have been a shame if younger users never got to experience the unique charms of MS Paint. I think a lot of budding digital artists use it when they're kids, then move on to more advanced programs. It's a lovely little program," he said.